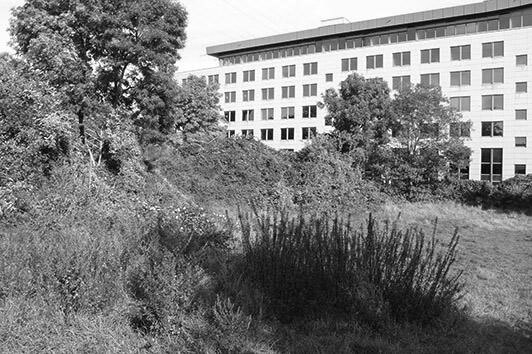 In the backyard of the huge administration complex, along the green strip next to the zoo’s wall, a zoned out plot of land is separated from the lawn and divide in four equal portions, covered with different types of gravel. Looking much like a minimalist earthwork, the borders being a little to neatly built, the area serves as a field test to observe the rain enters the soil and how plants go through the gravel. It’s a test for the permeability of a border. 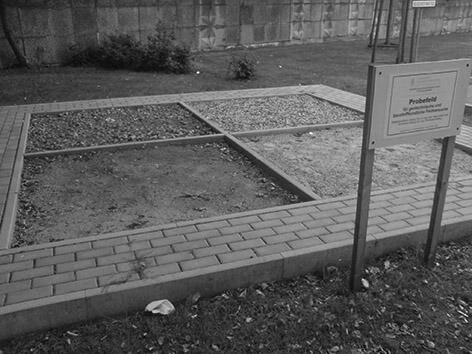 Although i’m very interested in all the ways soil can be shown, made present, available to reflection as the support for our life, this situation brings up a metaphorical bridge for my presence in Lichtenberg: A piece of the city crossed out of the mental map of many of the city’s inhabitants – and my own presence here plays a role, even minimal, in the way this part of the city can, will be rendered available to the whole. A modalized filter between two sides. Extraverted expressions of sympathy are like gas explosions. They are more and more rare, unexpected and when they happen, devastating. The man of the curry wurst caravan at the sbahn station Lichterfelde had for some reason a fantastic day. And made so ours. 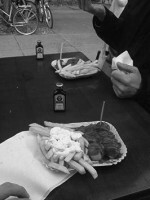 And now I know where the best currywurst are to be found in Berlin. Not only was the man overtly sympathetic and careful, and comprehensive for our bad local accent, but really had good sausages, offering 7 different levels of spiciness to make it better. The experience shone like a sun on the area, making us feel warmly welcome in an area that had left us until now mostly unaffected. We walk around a former industrial area turned into a green area with sculptures, jogging paths, playgrounds. 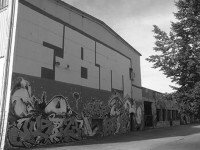 A series of depots are also there, entirely covered with graffitis. 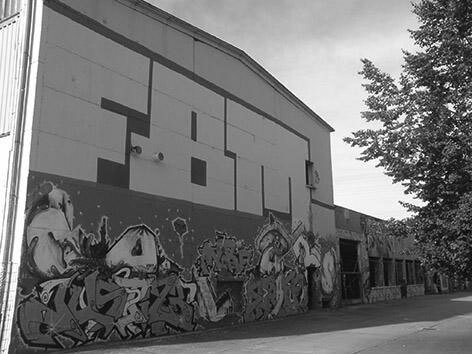 What at first sight appears like an abandoned industry hall, carefully fenced off, seems to be the headquarter of some a group, a posse, FBM. On one side a series of interpretation of FBM cover a wall: Fickn, baun, Malen; Fliegn, Baumeln, Motors, etc… Through the barriers we can see set up sceneries, more or less gore, around drugs, violence, police, state, capitalism, fun etc… But no one there and all entries are closed off. From afar we hear the echo of a basketball bouncing. As we turn around the building, we see three guys, two playing basketball on an improvised device and a third watching outside holding his phone. We look for a door, but there is still none. We walk up to the third young man, and ask him what is this here. “Well you see, it’s an abandoned depot”. But how did you get it? “We just got here”. Can we come in? “No, you see it’s dangerous, the roof is falling apart. We can’t let you in”: The two other guys were still playing. Our man got bored. “Well that’s it, bye”. But, sorry, what is FBM? “Can’t you read? It’s all written out there. It’s whatever you want”. No way to get more out of this. Even internet doesn’t give more about it. We leave the area, the bubble, so well self protecting. I’m a bit jealous of their autonomy. A curvy, bowlconcrete area certainly appealing skateboarders, but for now and each time we went along it totally empty, is placed next to Bahnhof Lichtenberg at the north tip of the Weitlingkiez. When it was snowy, a young girl was sliding down the hill on a cardboard. The kiez is known for housing an important population of neo-nazis. 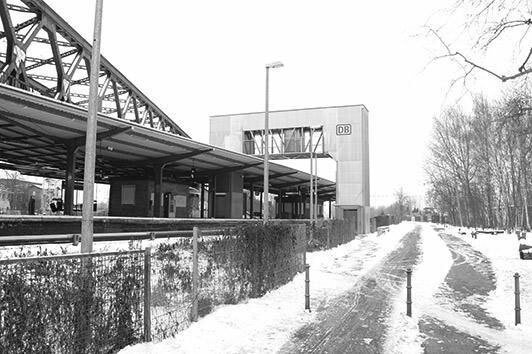 And this is basically the face of Lichtenberg most known by Berliners, before the zoo or the Ikea. A huge program had been launched by the city hall over two years, and it was efficient at least in one thing: They are hardly public anymore. Which doesn’t mean they are not there. I think it is definitely a reasonable question: How do you compose with people living next to you believing in these ideologies? I can’t kill them, nor can I deport them. I might not want them as neighbors, nor do they, but it happens. If Lichtenberg is part of Berlin, how does it take part in it. What is it’s part? Is it to be the neo-nazi ghetto (then overshadowing the fact that there are many of them also in other parts of the city). If the city hall want this to change, what is it going to be? A skateboarder friendly kiez (which is so fun: 15 years ago we got thrown out of the city with our colorful boards full of skulls and bones, and now skateparks are designers and architects delight for city center revitalizing along with “organic” shapes … )? Energy plants garden for sustainable resource. A test site amidst next to a leisure park, both on a former area used as rail yard for the industry. 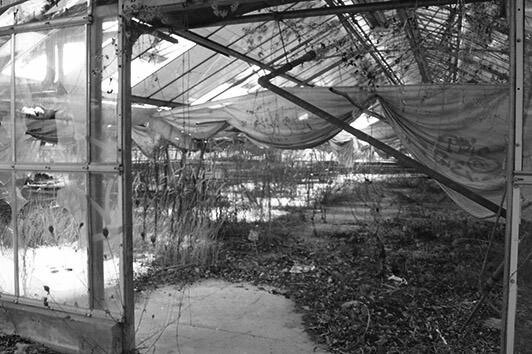 It looks like it would have wanted to be educational, but as I was walking trough the garden, there was no one, things and plants looked a bit derelict. At least things were growing. Lichtenberg provides a resource more and more limited in Berlin, which is ground, better said, free land. And this is not a sustainable resource, I mean, you can’t grow and harvest space, even less ground. In reality there is no free land, you always have to make it free. Which means you have to evacuate any previous attachments and make it available in order to be attractive, but for which (non-)attachments. It is today difficult to speak of attachments, soil, territory, without slipping toward a conservative positions, whereas at the same time, seen from the position of migration, the notion of re-rooting, of re-building attachments seems absolutely legitimate. So what happens when rooted meet re-rooted, How do generations of attachments entangle? Lichtenberg will soon undergo this process, it is obvious, and we, being there these few days, have yet no mean to experience and record that mingling (recomposition would be far too strong, it is a whole set of processes that are running in which the state, the city council only tries to insert some of its own, supporting its actual ideological project). We have no idea what this city can be. We walk along the derelict rail track formerly grouping the industries toward distribution, nowadays giving shelter to a network of paths used by undetermined range of actors. We reach an open area: trees, shrubs, lawns, little or no trash. It is used. The wooden fence towards the road that existed in September has been replaced by a metallic fence in January, probably after the storm knocked out the wooden one. And now you can see this area from the street… In September, at the corner of the wooden fence, we have seen an ad for dog walking. And obviously this is what the area was used for as we found cups that might have served for watering animals. So the area had found an economy. Somebody annexed it for its personal economy. Great. The area was next to an office building advertised as The Wave. Brand new, totally bad taste, with a visible decorative element that would make it recognizable, the building was empty. It hadn’t found somebody who could use it yet. Who are we here! Following the road form the wave we came along three buildings, two residential units and a kind of flat collective facility. Run down. Run down so far that from one of the units two workers were finishing the building, i.e. extracting all raw materials from which they can make money, piling the stuff into a van with polish plates. In front of the collective unit there was a fountain with a mosaic that must have been very colorful. An impression of misery took over the potentiality gaze: From a position looking around for what can happen the gaze shifted toward seeing what is going on right here. And it was ugly and irremediable. The snapshot here is a very uncomfortable one. It’s an ugly catch with an ugly feeling and you can’t see it. The other residential unit was occupied. It was apparently full. Windows were open and closed, curtains made of whatever animated the sunny facade. This joyful heterogeneity stirred my bad feelings even more, challenging my very presence. We left the plot. Facilities from the former regime were taken over by the state and developed. So has the former winter sports training area, a comprehensive set of stadiums, hotels, offices, wardrobes, etc… been taken over and extended for federal sports team. 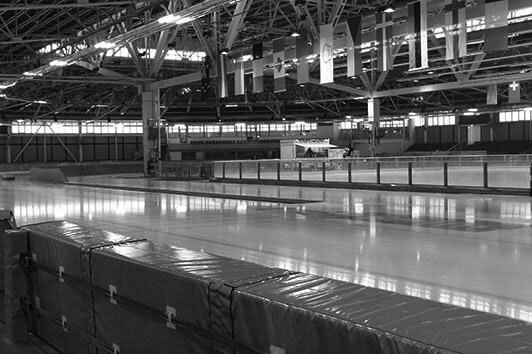 It includes a group of covered ice fields, mostly closed to the public, where athletes were training. One of these stadiums was partly open to the public: The speed skating stadium had in its center two smaller ice fields where schools would come during the day and once a month an ice disco would take place here. The elegance of that sports tempe contrasted with the smell: next to the small ice fields was a wurststand. While the olympic athletes were training, you could enjoy a wurst with a cup of filter coffee. We strongly regretted that our residency was not on the week when the ice disco would occur. When we left through the snow, several classes were waiting in line to get their skates. We had no idea of that ice stadium and i planned to come back here with my family: it was a secret and exotic spot away from the city center and its fancy equipments as much as well organized ice rink. It would be an experience. Our tour led next to many industrial leftovers, some of them already on the way of being rehabilitated. This ambiance (Stimmung) supporting the visible space as being under the prospect of potentiality accompanied me most of the time, modulating my gaze, leading me to project my own activity into any built object I would see. During our tour I was becoming a large scale sculptor organizing huge parties in his mind blowing industry-sized studio. Yeah. Look at that concrete skeleton, it’s perfect! Our spontaneous running-game was: Where would we spend our half-million euros? Would we want to stay here, what would we do to make it possible, likable to be here? We were about to do the widely slandered job of general attraction factor raising. And stopped. And started again as soon as another site catches our mind. Through our wandering we were seeing how this potentiality game had to stay under the radar of bigger players, although also conscious that we weren’t the first out there, neither that we were alone. Much better trained scouts were doing the job far more systematically, but they wouldn’t be invested with that surplus value we had: the cross-cultural actors able by practice and self-need to stitch up territories in order to create a space in which they could live and make a living. We were process agents, but we could easily be taken over, or integrated by project agents. Many times we thought we should stop, step away from our investigation, leave the territory untouched. And there’s the “paradox”, you can’t leave anymore, it’s already happening. There is no wake-up in which to escape. There is a place I really like. It catches me deeply. I love it. I want it, I want to be there, I want to have it for me and I want it to take me. 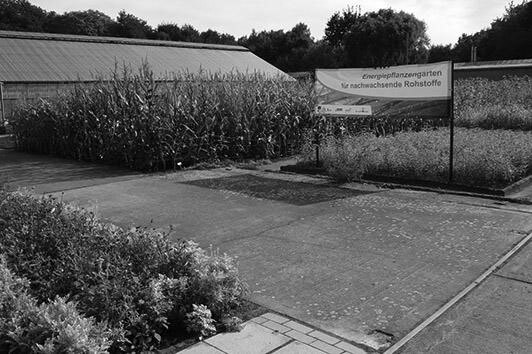 It was our most intrusive exploration and a total delight: The former greenhouses of Lichtenberg, where the garden services of the city would grow the plants to be installed in- and outdoor in the city. The service has probably been reduced and displaced, due to huge budget cuts some years ago, leaving the area growing wild and unattended. The plot is for sale. We went by several times and finally entered the plot. From outside you see bushes and the glass roofs, mostly intact. Once inside, it’s a science fiction movie, some quite and soft post-apocalyptic scenery. Plants took over, profiting from the situation. As we were in winter, the roofs were covered with snow, the plants like sleeping. Wild quietness. The intermediary situation of out- and inside makes a space that shelters without being smothering, not like the walls of a run down house and encloses a bit more than just a forest. Silvery fabrics hang from the metallic structures above our heads, giving it a techy taste. Also a useful isolation if needed. A feeling known from previous explorations rose: What if we met somebody here? What language would we need to speak? What code are going to improvise for the encounter to be rich and peaceful? I could perfectly imagine the place being used as a hideout over the night. We walked around. We spent some time enjoying the space. Just enjoying. We did not meet anybody. For once, this was just ours. 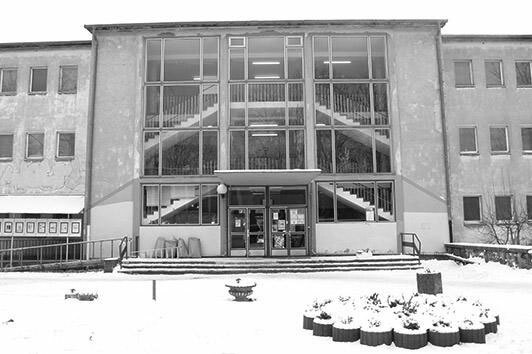 A place which was definitely not our and we stumbled in by interest for it’s name [Namen FINDEN] was a former school transformed in a associative “multiplex”, hosting different organizations, activities and a canteen for the elderly. 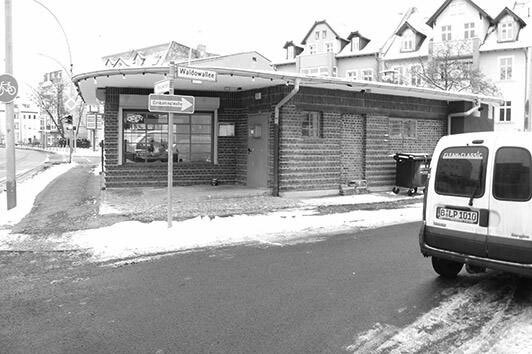 We explored the building, a cosy, smelly and welcoming daedalus of watercolor exhibitions, reunion spaces and photographic documentation of many public sculptures in lichtenberg, of which we added some to our tour. It’s a community center. How call it otherwise. A cultural center wouldn’t exhale the same quality of attachment, of locality. 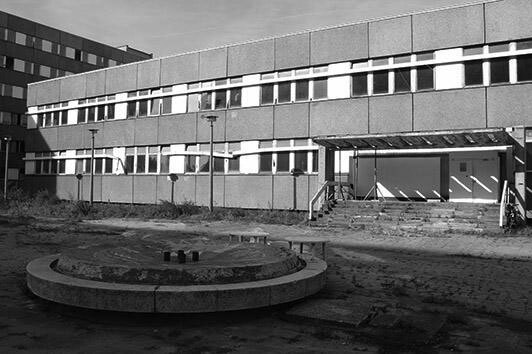 Next to the main school, in a more recent construction, less definite, was a youth center, mainly hosting a radio program, the Jugendfunkhaus. A visual note: seeing many buildings from before the 90′, I appreciated so much the old window frames, doors, doorknobs etc… all being nearly unique, at least a generic way of making it simple and unique for the building. Now the generic is replaced by standards to which the buildings are adapted, including these large window frames and synthetic wall insulation which lat any building look like a minecraft sketch. This supermarket overtook a patrimonial infrastructural remain from the 19th and extended it in order to fit its own standards. Brightly restored, the brick building combined with the logo of the chain provides a colorful spot in the landscape. In Foam City, Sloterdijk exemplifies the repurposing of buildings to new and yet unestablished needs by telling the story of how the french revolution used churches and palaces to held their reunions, taking shape by default in those spaces built with an antagonistic view of the world. The relation of the supermarket with the former train garage seems so far far more streamlined, the continuity more evident, sadly. But it is also liberating sometime to consider the boldness with which industry allows itself to bend and repurpose the real to its own need, and I keep this bold thinking in mind as a way to build my own continuities. 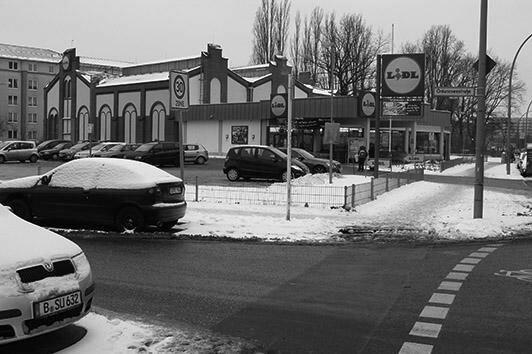 The few streets behind the supermarket, reaching to the tracks of the S-bahn, host the very first plattenbauten. We remembered it when tracking back our daily journey on a map and comparing it with the photographs of the photographs shown in the [Namen FINDEN]. In front of the Tierpark, next to the Star-trek-like mall, two foreign students asked us their way to the university in English. We could help them we our city map and discovered for ourselves that there was the Wirtschaftfachhochschule nearby. Soon after, looking around us again, we saw a new population mixing with the until now mainly local adult population: a cosmopolite population of students speaking many different languages that was gravitating around the school. 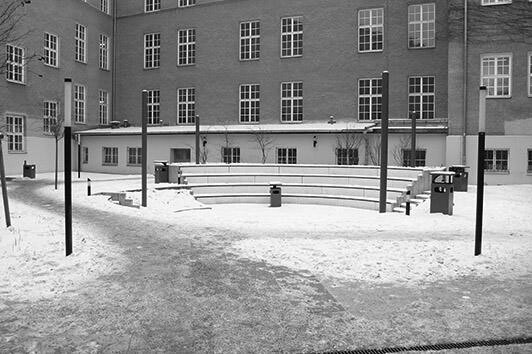 As our journey led along the school, we went into the courtyard. A kind of circular forum with a slightly sunken bottom was lying under the snow, circumvented by the traces of the students. The recent installation appeared like an amendment to the rather dry building, trying to give it a more open, welcoming and sharing-friendly nature – all this being inconveniently exposed to berlin’s climate. Again the thousand years old model got called back again from the dead, waiting stoically under the sky for a functional replacement. 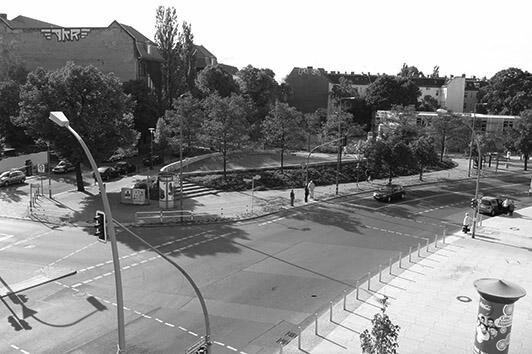 Where can urban experience take place in Berlin? As Berlin slowly slips away from the status of capital of the cool, heterogenous experiments are taking place here and away from the limelight and we are somehow confident that they will remain out of focus for a little while. So what do these probably autonomous initiative, public and private, do? (we assume that the Bezirk, an administrative and political sub level of the city hall of Berlin, does not have the financial means to impose a fully regulated master plan and so able to be the chef d’orchestre) What does this heterogeneity do? Former modernist bus stops are repurposed as pizzeria. Industrial land is bought up both by the federal state to set up facilities, like that experimental garden, and by international investors from India and Vietnam. Audi R8 sports car are parked in front of modest villas. Prisons are turned into museums, contemporary townhouses grow next to modernist ensembles. African car dealers prepare the shipping of second-hand cars in their yards next to music clubs. Olympic ice skaters train along school classes taking their sports classes out of the campus. Enumerated in this concentrated manner, it sketches a whole new portrait, and elaborates a complex and pluralistic environment, fragile and far less streamlined than the urban experience advertised for Mitte, Prenzlauer Berg or Kreuzberg. But then it shouldn’t be also forgotten that this takes place over a huge area, where a lot of space is vacant between spots. If each spot often present a kind of combination, they hardly can be seen as visibly connected. And why should they be? The run-down factory hosts some activity in its ground floor, the upper floors being too degraded and an unclear question of ownership restrains any investment attempt. 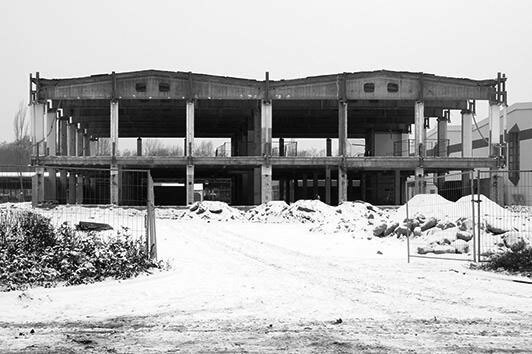 The factory lies behind a 5 story-building where the workers formerly lived. 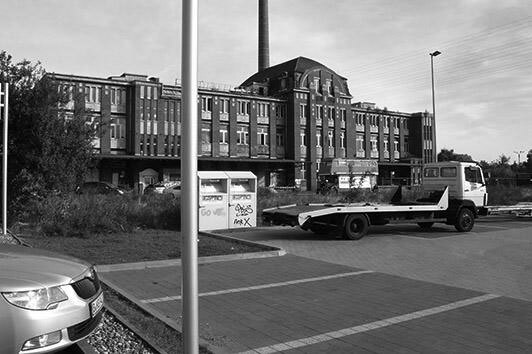 On the carless stripe between the factory and the building we encountered something unimaginable city in northern Europe: A gang of children playing on the street, freely exploring heaps of sand, car wrecks, throwing stones and circling around with bikes and tricycles. It felt like a color movie set in the 30’s, wasn’t there the same supermarket chain closing the strip on the corner plot. The new supermarket was facing a new use of the former factory space. Multiple new coexist. Many models running at the same time. Each of them giving an account of and producing a part of the real. I think that having these next to each other, not really clashing but also unmediated gives the possibility to evaluate what it produces for a reality. So far, I can’t say I want to live there, but I also can’t say that I don’t want to live there. The claim for boldness I made earlier should be a liberating call for Europe’s patrimonial territory to allow local horizons to generate their specific answer. An invitation to further testify and define the distinction, introduced by Jeremy Lecompte, between the generic and the standardized – This is an elevator to get from the walking path to the platform. It is not two elevators connected by a pedestrian bridge. For some situation-bound reasons, the elevator goes up, travels across the bridge and goes down. It is unique.